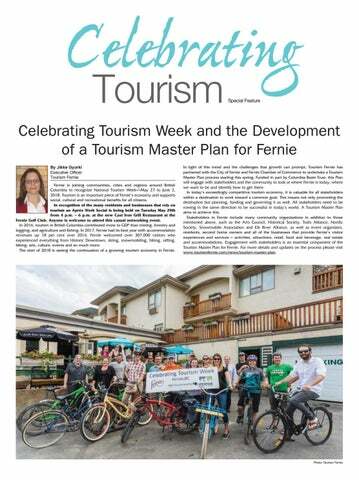 Celebrating Tourism Week and the Development of a Tourism Master Plan for Fernie By Jikke Gyorki Executive Officer Tourism Fernie Fernie is joining communities, cities and regions around British Columbia to recognize National Tourism Week—May 27 to June 2, 2018. Tourism is an important piece of Fernie’s economy and supports social, cultural and recreational benefits for all citizens. In recognition of the many residents and businesses that rely on tourism an Aprés Work Social is being held on Tuesday May 29th from 4 p.m. – 6 p.m. at the new Cast Iron Grill Restaurant at the Fernie Golf Club. Anyone is welcome to attend this casual networking event. In 2016, tourism in British Columbia contributed more to GDP than mining, forestry and logging, and agriculture and fishing. In 2017, Fernie had its best year with accommodation revenues up 18 per cent over 2016. Fernie welcomed over 307,000 visitors who experienced everything from Historic Downtown, skiing, snowmobiling, hiking, rafting, biking, arts, culture, events and so much more. The start of 2018 is seeing the continuation of a growing tourism economy in Fernie. In light of this trend and the challenges that growth can prompt, Tourism Fernie has partnered with the City of Fernie and Fernie Chamber of Commerce to undertake a Tourism Master Plan process starting this spring. Funded in part by Columbia Basin Trust, this Plan will engage with stakeholders and the community to look at where Fernie is today, where we want to be and identify how to get there. In today’s exceedingly competitive tourism economy, it is valuable for all stakeholders within a destination to work toward a common goal. This means not only promoting the destination but planning, funding and governing it as well. All stakeholders need to be rowing in the same direction to be successful in today’s world. A Tourism Master Plan aims to achieve this. Stakeholders in Fernie include many community organizations in addition to those mentioned above, such as the Arts Council, Historical Society, Trails Alliance, Nordic Society, Snowmobile Association and Elk River Alliance, as well as event organizers, residents, second home owners and all of the businesses that provide Fernie’s visitor experiences and services – activities, attractions, retail, food and beverage, real estate and accommodations. Engagement with stakeholders is an essential component of the Tourism Master Plan for Fernie. For more details and updates on the process please visit www.tourismfernie.com/news/tourism-master-plan. encourages guests to return. Every person in our community that encounters a visitor has an opportunity to influence that guests experience, and the Ambassador Program provides the tools to make that experience great. The Ambassador Program is open to anyone who would like to take it. Questions about the program can be directed to the Chamber of Commerce or visit fernieambassadorprogram.ca for more details. The Fernie Chamber of Commerce is excited about the growth of our tourism industry. The visitor centre last year welcomed over 17,000 guests, a 15 per cent increase over 2016. We are looking to continue building the Ambassador Program as a strong tool for local business. Local businesses understand that each touchpoint with a visitor is an opportunity to contribute to an outstanding visitor experience. The chamber encourages you to welcome visitors to our community, help them enjoy it as much as we all do, and celebrate the opportunity tourism brings to our community’s future success. GROWING THE PEOPLE THAT POWER FERNIE. Join the Chamber of Commerce. And ﬁnd out how membership pays for itself. 250.423.6868 Look for the Mobile Visitor Kiosk at local events. distributed far beyond our city limits, a broad spectrum of the potential tourist demographic is exposed to great things Fernie has to offer. The real benefit of these beverage based businesses is their sustainability throughout the year. The offerings of this type of tourism is not determined by the seasons, conditions, or weather, so there is a level of consistency offered throughout the year and over time. In the event that Mother Nature throws a wrench into the plans of recreational tourism (rain, snow- or lack of, fire…) this sector provides an outlet for tourists to enjoy the other aspects of what makes Fernie a unique and special place. As this tourism sector continues to grow and diversify it is surely going to attract foodies and beverage Photo: Tourism Fernie connoisseurs to our humble mountain home. Given the potential for new businesses and catering to a new tourism demographic, watch for new and exciting developments in your local F&B industry. Our flourishing beverage sector is another way for tourists to drink up the Fernie stoke and create memorable authentic experiences for people from all walks of life, ages and abilities. Abi Moore – Fernie Brewing Co.
“Tourism is a fundamental part of Fernie. Its development, success and growth over the years has not only enabled new businesses to pop up and thrive, but allowed existing business to grow, develop and increase offerings to the community. The support Fernie Brewing Co. receives from both locals and visitors alike, has resulted in us being able to in return, wholeheartedly support the Fernie community – via events, festivals, fundraisers and our “Cheers to Charity!” program. It’s our way of saying thanks. – Chantel Vincent Freyja Lifestyle Fashion tail. But why? •	60.09 per cent of respondents use a smart phone to connect with the internet •	No Surprise. 99 per cent of people use the internet to research a trip •	50.86 per cent of people spend one - five hours per week daydreaming about a trip and browsing the internet even when they have no trip planned •	Travelers rated the importance of digital channels and content in the following order: 1. Quality photos of a place 2. A businesses website 3. Maps of the area 4. Videos of a place •	75 per cent of people say they have been influenced to go somewhere based on a friend’s social feeds. 30 per cent have changed their travel plans based on the same! •	45.70 per cent of people have asked their social networks where to go within a certain destination. •	70.27 per cent of people prefer to contact a business through their website or social channels rather than the phone. •	72.32 per cent of people have booked a travel activity through their mobile device. What does all this mean? In a general sense, we need to understand that the tourism and marketing landscapes have drastically changed, especially in the last five years. Here are some key points; * Digital Media dominates ALL phases of travel. * The inspiration and research phase is now 24 / 7 / 365. * If your site isn’t VERY mobile friendly, you are losing money! * Mobile devices are now the guidebook, video camera, high-res still camera, map, communication device and sometimes... a phone! * Digital habits seem to flatten out after the age of 45. * Quality content is now the very heart of marketing and branding. 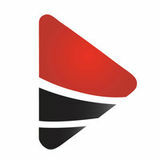 * Consumers and travelers want to be inspired, entertained and educated. Overt sales pitches are a turn off in many cases. * Quality photos are perhaps the most important aspect of digital marketing. * Consumer segments continue to fracture. * Calculating ROI has become very difficult, especially for small businesses. * Power has shifted from the business to the consumer. Instead of a 1-way message, a 2-way conversation should be the new path. Wherever Life Takes You, Best Western Is There.® Fernie Mountain Lodge 1622 7 Ave, Fernie, BC 250-423-5500 Toll Free: 1-866-423-5566 www.bestwesternfernie.com Each Best Western® branded hotel is independently owned and operated. Along with cultural attractions and local cuisine, they seek: • a place with beautiful scenery; • destinations for outdoor activities; • a great place to relax and get away from it all; Thanks to a thriving industrial base, active business community, • a place with lots of things for families to see and do; and abundant recreational options, the Elk Valley is home to a broad • a great place for fishing and low-impact hiking; segment of the population seeking a well-rounded lifestyle. With this • a place with lots of things for mature adults to see and do. vibrant and varied populace comes an active arts community and a An increasing number of today’s workforce are engaged in the creative economy. This rich heritage legacy from strong roots in coal mining and pioneering, has been an integral factor in the creation of a new tourism sector - Creative Tourism. creating a powerful draw for visitors to our community. Visitors in this sector seek to enrich their travel activities by actively participating, doing The typical cultural tourist shares the following characteristics: and creating. An increasing number of travellers are seeking classes, workshops and one• earns more money and spends more money while on on-one experiences with artists to enrich their travel experience, learn new techniques, vacation; and engage with local practice and tradition. _______________________________________________ • spends more time in an area while on vacation; In 2019, Fernie celebrates 100 years of tourism. • is more likely to stay at hotels or motels; Tourism Fernie will be adopting the Fernie Tourism Master “the practice of traveling to • is far more likely to shop; Plan, a blueprint which builds on the vision of J.F. Spalding, experience historic and cultural • generally well educated and consider themselves who, with the Fernie Board of Trade, founded the East lifelong learners; Kootenay and Southern Alberta Tourism Association to attractions to learn about a • generally women; promote this region. This strategic document will foster new, community’s heritage, culture and • tends to be in older age categories responsible growth and collaboration within the tourism • less leisure time but a greater emphasis on quality community. The good news for Fernie and the Elk Valley lifestyle in an enjoyable and time experiences. is that we offer a tremendous diversity of attractions, and educational way. The cultural tourist market is highly sought by others in Cultural and Creative Tourists not only want to experience a the tourism sector and societal trends point to the increased _______________________________________________ community’s culture and way of life first hand, they also want importance of culture as a travel motivator. Baby boomers to enjoy the outdoors. will account for a growing market segment as they grow Concurrently, heritage and cultural planning is being undertaken by other community older over the next twenty years. By 2026, people over the age of 55 will account for 2/5 organizations. Together, the two plans will provide thorough community- and stakeholderof Canada’s population. As a result, the number of Canadians who will be in the market driven tools that will strengthen existing cultural programming and facilities, provide for heritage activities will grow from an estimated 2.6 million now to about 3.7 million a comprehensive strategy to direct future investment in all tourism sectors, and foster in 2026. A vastly larger number of visitors also seek museums, art galleries, festivals and meaningful engagement for residents and visitors alike. other cultural pursuits as a secondary motivator in travelling. our lodge is available for weddings, corporate retreats, reunions, or private parties? Call us at 250-423-6704 or stop by our office located inside the Park Place Lodge to discuss booking a fun adventure or business event! Free high-speed unrestricted internet in every room. Complementary deluxe continental breakfast. A great outdoor hot tub. Fridge, microwave and coffeemaker with coffee in all rooms. 40” TV with the full cable package. Business center. Free guest laundry machines. Multi purpose room and barbeque grills. Free long distance calling with in Canada /US. Secure Ski and Bike storage. Wyndham rewards Friendly knowledgeable local staff. Beyond creating jobs and generating revenue, tourism helps build attractive and livable communities. Travelers seek authentic and nature-based experiences. Fernie’s culture, heritage and environment are all essential assets to a successful tourism economy and represent priorities to residents. Tourism investment helps to increase services, programs, attractions and recreational opportunities that residents also enjoy. As such, tourism creates a platform for positive change by positioning Fernie as a great place to live, work, play and invest. Any undesirable change, such as adverse impact on trails, can be mitigated through collaboration and effectively and sustainably managing growth. Tourism generates many types of revenues for a region, including business income, wage earnings, share earnings, rates and taxes. Direct spending by visitors positively impacts business profitability and employment growth. The money is then ciculated and re-spent in the community via indirect spending, such as staff spending their pay checks on rent, mortgage, groceries, entertainment, clothing, sports equipment etc. This indirect spending attributed to the tourism economy is called the multiplier effect. This also serves to effectively redistribute wealth from urban to rural areas with city dwellers visiting small towns. Understanding tourism’s contribution to a community is central to developing an informed tourism planning approach, strenghthening the support of community stakeholders and local government, and encouraging an appreciation of tourism’s economic benefits and development potential. Join us Tuesday May 29th to Celebrate Tourism Week! $16 million in ‘annual visitor spending’ alone. Fernie: A Story of Community and Tourism By Matt Mosteller Senior Vice President Marketing & Resort Experience Resorts of the Canadian Rockies There are few places on earth that brings the sense of awe that comes from this incredible place- full of passionate people and a spectacular natural setting. Many travellers come to Fernie from all over the world to be inspired- many return again and again because of this very reason (or choose never to leave for that matter). We are grateful for the community leaders, stakeholders and providers of a variety of mountain lifestyle experiences, who cultivate Fernie’s uniqueness and strive to embrace a multitude of opportunities to broaden and enhance our communities social, environment and economic health. While we are (obviously) big fans of tourism and want to share our enthusiasm for all of the efforts of each and everyone involved in providing remarkable experiences, we also want to give a shout out for those in a supporting role for our tourism economy and those who are a partner of a person involved in our local tourism industry - Thank You. Thank You. AND Thank You again! For us, we equally want to celebrate all of the volunteers – a big shout out goes to lending their time in our community, whether it be with a club, a non-profit organization or community group where volunteers are the heart beat - thank you as well for doing what you do! Did you know? We at Fernie Alpine Resort and Resorts of the Canadian Rockies are here to support your volunteer, non-profit or community-based organization? We’re forever grateful to the passion of the people from Fernie, to their ongoing support of Fernie Alpine Resort, for their never-ending love of winter, outdoor adventure and most of all for where they live! In fact, Resorts of the Canadian Rockies created the ‘Community Summit Fund’ in 2007 to support community programs, schools and charities wherever possible. The first 5-years of the Summit Fund supported over 100 community organizations and projects totaling over $150,000. With the initial program coming to a close, it was officially renewed indefinitely in 2012. Since being renewed the fund has provided grants for over 300 individual organizations or community events bringing the total dollar value of contributions to well over $300,000. Some of the organizations that have benefited from this community program are the B.C. SPCA, Fernie Mountain Film Festival, Wapiti Music Festival, Fernie & District Historical Society, The Fernie Ghostriders Adventure Camps and Fernie Griz Days. In addition to supporting our community organizations and members, the Summit Fund also provides a scholarship to a lucky student from both high schools each graduating year in an effort to further the education of our local youth. Fernie, B.C. – named as ‘The greatest place on Earth’, where the beer is brewed locally and where the ‘no friends on a powder day rule’ is observed with full commitment. If you’ve visited and found yourself not wanting to leave, well, it’s not the first time we’ve heard that (and probably won’t be the last). Finally it is a privilege to be in this amazing place and we take that very seriously. Plus Bonus Weekends in September! trail crew spent an enormous amount of sweat and calories to complete this gem of the Lizard Range. The trail itself starts at the top of the Spineback trail (at the second bench) and follows the valley between Baby Bear and Papa Bear peaks. It wraps around the back of Baby Bear to the Upper Nonstop saddle with dramatic views of the headwall and The Valley. The trail continues around the east side of Baby Bear and follows a series of switchbacks down the valley between Baby Bear and Mama Bear peaks. It then completes the loop back at the top of the Spineback Trail. Why the name Goldilocks? Well, a trail through the peaks of the 3 Bears built by all women kind of named itself. Length: 2.5 kms Elevation Gain: 210 metres. Max Elevation: 2,075 metres Min elevation: 1,865 metres. When Combined with the Spineback Trail - Length: 6 kms Elevation Gain: 740 metres. Rating: Advanced There are also new menus in the restaurants and spa. Have a look at the website for details and other information. The Bear Lodge has extended hours starting at the beginning of the season - Bear Lodge Hours – Open 11 – 8 from June 8th to Sept 3rd. 11 – 5 from Sept 4th – Oct 7th. Of course, after a good hike or bike, some time in the Spa would be great. Ladies day each Wednesday: book a Spa Manicure / Spa Pedicure combination for $110 (a $160 value) Book 2 or more treatments and receive 15 per cent off (does not include manicures or pedicures). *Both specials must be for the same client, on the same day. Have a great summer and we will see you on the trails. Wine Tasting Wednesdays All Summer! 5 course tasting menu perfectly paired with 5 wines from our diverse cellar. $99 per person Bear Lodge Restaurant Hours – Open 11 – 8 from June 8th to Sept 3rd. 11 – 5 from Sept 4th – Oct 7th. Avoid disappointment - call ahead to inquire about reservations and availability. Check our website for spa specials, guided hiking, hours of operation and accommodation packages. better while camping? Sleep quality is imperative to body function efficiency. Getting into a good sleep rhythm while camping can help you maintain it when you go home. The simplicity of camping via removal from technologies and everyday stresses is beneficial to reducing anxiety and depression. For numerous reasons, camping in nature is beneficial to your physical and emotional health. 6) Simplicity You wake up to the sound of birds and waves lapping on shore. Light the fire or stove to boil water for coffee as the early morning sun rays play on the water. Today’s to-do list: relax, eat, have fun, breathe. When you’re camping, you’ll find fewer distractions from what’s important. 7) Big Rewards Even When Short on Resources Need a change of scenery but don’t have the time or resources for a big trip? Go camping! It’s amazing how you really feel like you’re getting away from it all even when you’re half an hour from home. Camping is so different from everyday life that you will find you’re recharged even if you only go for one night. 8) Variety You’ve seen one hotel room, you’ve seen a thousand hotel rooms. How much variety do you find from hotel to hotel, really? There’s a bed, there’s a bathroom, there’s a lamp. With campsites, however, the details of your site are enough to burn a mental photograph and create fond memories for years to come. You’ll always remember the time you scored the spot on the cliff overlooking the water, or when you were a kid and your parents would request the spot next to the playground. 9) Adventure The unknown aspect of camping is exciting. Will you see wild animals or discover a new favourite hiking trail? Is it going to rain and you’ll have to scramble for your things and huddle in the tent playing cards? Maybe it’s a first-come-first-serve campground and you’re trying to get a spot. Camping is different from the norm and unfamiliarity can be fun. 10) Camping Food S’mores, banana boats, campfire-roasted hot dogs, breakfast hash in a cast iron skillet. Combined with fresh air for the most satisfying meals ever. When planning your summer trip, choosing camping will result in money saved, closer relationships, lessons learned and new perspectives. You’ll come home relaxed and grateful for the time you’ve spent outside. Here’s to long summer days, crackly campfires and leak-proof tents. Happy camping! Don’t miss the BEST day of your summer!